Wild deer also display this behaviour – a phenomenon that has apparently gone unnoticed by herdsmen and hunters for thousands of years. In the Proceedings for the National Academy of Sciences, scientists say the Earth’s magnetic fields may influence the behaviour of these animals. Many species – including birds and salmon – are known to use the Earth’s magnetic fields in migration, rather like a natural GPS. So far, he has let us all down. My guess is he will continue to do so. And that decision, for my part, ends whatever respect I once had for him. On core moral issues, where this man knew what the right thing was, and had to pick between good and evil, he chose evil. When he knew that George W. Bush’s war in Iraq was a fiasco and catastrophe, and before Donald Rumsfeld quit, McCain endorsed George W. Bush against his fellow Vietnam vet, John Kerry in 2004. 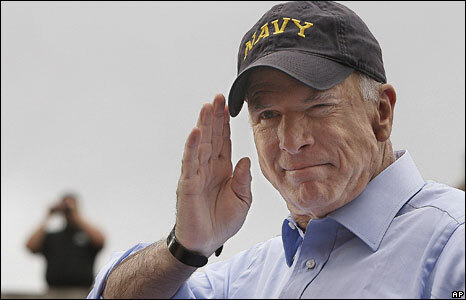 By that decision, McCain lost any credibility that he can ever put country first. He put party first and his own career first ahead of what he knew was best for the country. And when the Senate and House voted overwhelmingly to condemn and end the torture regime of Bush and Cheney in 2006, McCain again had a clear choice between good and evil, and chose evil. He capitulated and enshrined torture as the policy of the United States, by allowing the CIA to use techniques as bad as and worse than the torture inflicted on him in Vietnam. He gave the war criminals in the White House retroactive immunity against the prosecution they so richly deserve. The enormity of this moral betrayal, this betrayal of his country’s honor, has yet to sink in. But for my part, it now makes much more sense. He is not the man I thought he was. And when he had the chance to engage in a real and substantive debate against the most talented politician of the next generation in a fall campaign where vital issues are at stake, what did McCain do? He began his general campaign with a series of grotesque, trivial and absurd MTV-style attacks on Obama’s virtues and implied disgusting things about his opponent’s patriotism. And then, because he could see he was going to lose, ten days ago, he threw caution to the wind and with no vetting whatsoever, picked a woman who, by her decision to endure her own eight-month pregnancy of a Down Syndrome child in public, that he was going to reignite the culture war as a last stand against Obama. That’s all that is happening right now: a massive bump in the enthusiasm of the Christianist base. This is pure Rove. Yes, McCain made a decision that revealed many appalling things about him. In the end, his final concern is not national security. No one who cares about national security would pick as vice-president someone who knows nothing about it as his replacement. No one who cares about this country’s safety would gamble the security of the world on a total unknown because she polled well with the Christianist base. No person who truly believed that the surge was integral to this country’s national security would pick as his veep candidate a woman who, so far as we can tell anything, opposed it at the time. McCain has demonstrated in the last two months that he does not have the character to be president of the United States. And that is why it is more important than ever to ensure that Barack Obama is the next president. The alternative is now unthinkable. And McCain – no one else – has proved it.